Gran Canaria has many wonderful corners waiting to be explored; unique landmarks, interesting scenery and fun excursion opportunities - the best part is, several of these highlights can be enjoyed free of charge! Gran Canaria has many wonderful corners waiting to be explored; unique landmarks, interesting scenery and fun excursion opportunities – the best part is, several of these highlights can be enjoyed free of charge! It’s an unavoidable fact – holidays cost money, at times even a lot, especially for a long one in Gran Canaria. Fear not! There’s plenty of cheap flights to Gran Canaria to stay on the lookout for as well as affordable hotels and accomodation that still allow for comfort. For those excited to see more than just the beach, here you’ll find tips and suggestions for activities, sightseeing destinations and excursions that are practically free. In the case of museums, many cost only a small entrance fee and are lovely to visit, however this list will contain activities only costing money when taking transportation into consideration, such as when a car is needed to get there. Penultimate item on the list is the sole exception. What is there to do in Gran Canaria? 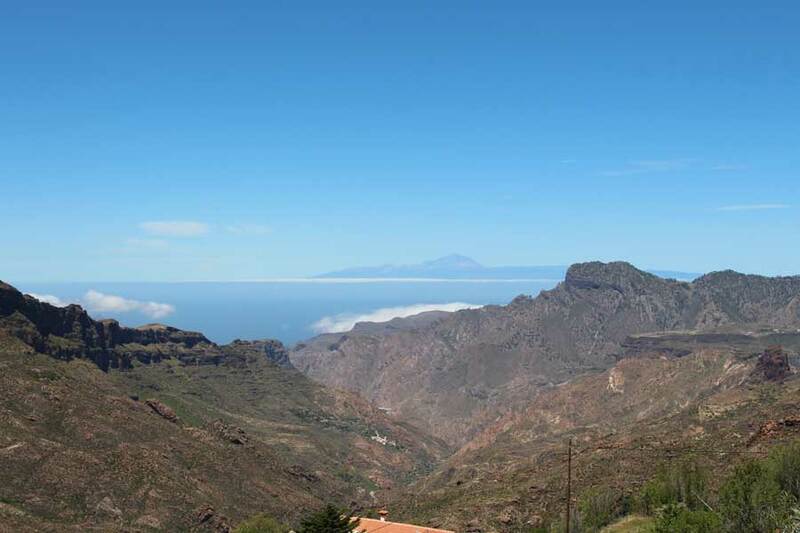 Gran Canaria is quite large indeed, so here is just a selection of things to consider, sprinkled with insider tips throughout. Don’t forget, the island still has so much more to offer than these morsels. More tips with greater geographical orientation will be added soon, promised! 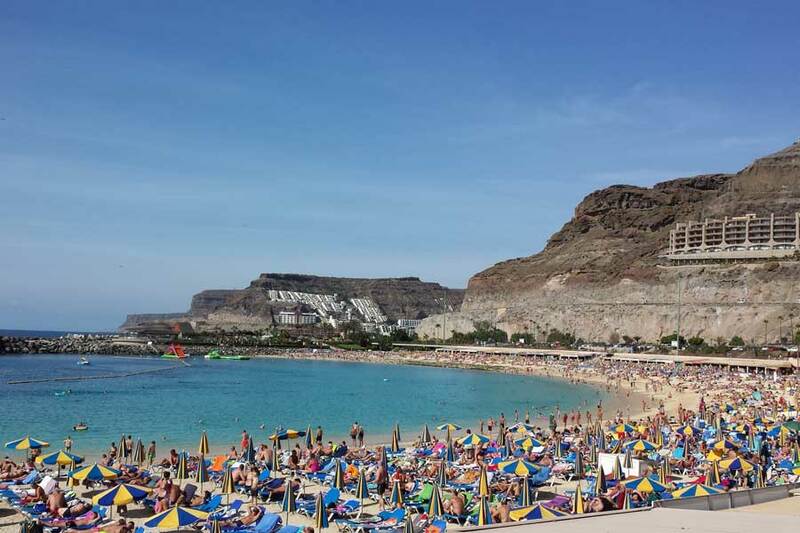 Playa de Amadores – the lovers beach . In Spain, a beach is not permitted to be a private property, as such, this beach-going experience sets itself apart from others – for example, in the Mediterranean, often the most beautiful and luxurious beaches belong to hotels who may impart their own rules or restrictions upon the area. Here in Gran Canaria one can pretty much go to any beach and nearby sea they want, the only exceptions being La Isleta (the peninsula of Las Palmas) in the north, which is a military restricted area and the peninsula connecting directly to Gando airport. Some seas on the north are also too steep and rocky to be accessible. Thankfully, there’s still a plethora of stunning beaches to visit, all fully accessible; smooth, sandy beaches with a Caribbean vibe like Amadores beach, beaches perfect for water sports (themselves not free, but worth it) like Anfi, warm Playa del Ingles, lonely bays, cliffs overlooking beaches, beaches nestled in the city like Canteras in Las Palmas, stony beaches… and the list goes on! Note that sunbeds and chairs on certain beaches will cost a bit to rent, but they’re definitely not a requirement. Now, one might expect me to mention the remote Guigi beach (which even I have not yet been to) while it’s rumored to be the most beautiful on the island, it is also certainly the loneliest. There are two noteworthy swimming locations I would instead like to emphasize here, the first being Playa de Amadores. It’s soft, golden sand looks and feels amazing, and the well protected bay makes it perfect for beginners. The second, can be found in the fishing village Castillo del Romeral (located between the airport and Maspalomas). Its home to warm, calm, ‘sea swimming pools’ likewise protected by a bay, however there are no flags here, even in high season, as well as no lifeguards – this means it’s especially important to look after oneself, and make note of when it’s best not to swim. Castillo del Romeral – promenade and sea swimming pool. The beaches in Gran Canaria not only benefit on land from superb weather, but also in the sea thanks to water temperatures that stay quite pleasant even in the winter. See Beaches Gran Canaria for more information. We once had some visitors come over from Germany, a busy couple distracted by all manner of things (one had a laptop with them for work purposes). On their very last day, while traveling down the highway, they asked what on earth those giant ‘sand piles’ on the horizon actually were. 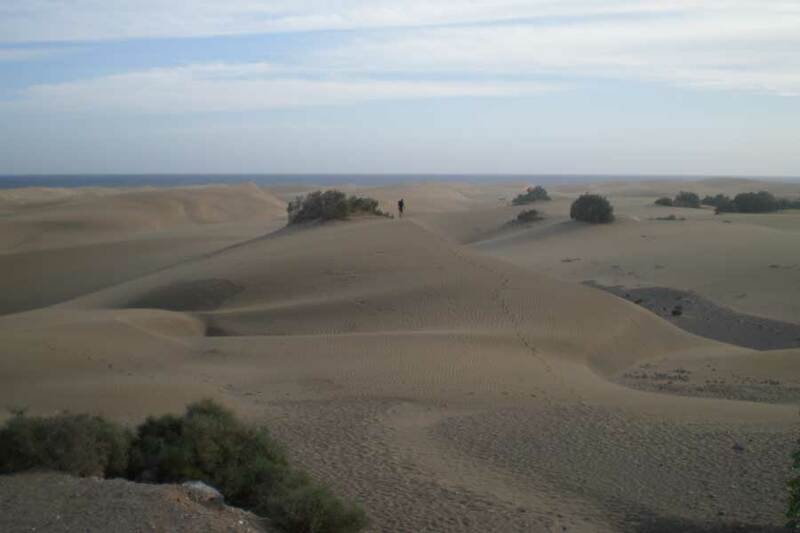 What they were seeing, are the dunes of Maspalomas, and they really missed out. The dunes are worth heading to at all times; early morning, afternoon and especially in the evening, when the sun sets beautifully over Gran Canaria. The dunes can be climbed, walked through, admired from afar and even ‘surfed’ if one desires, but however you choose to explore, please have some water on hand as it can get very hot on the dunes in warmer months and its important to stay hydrated. Be aware of barriers and fences – part of the dunes is a nature reserve, the breeding grounds of a rare bird that should not be disturbed. Crossing the dunes at their narrowest point to toward this nature reserve, that is quite far away indeed, will leave you at the end of the Avenida de Tirajana in Playa del Ingles. 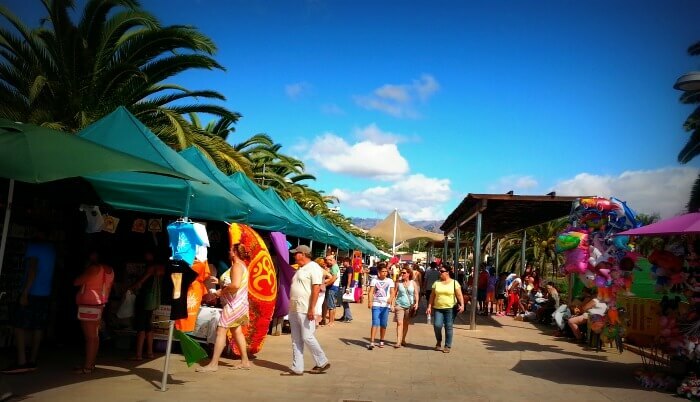 In addition to the colorful market in Maspalomas, which offers more of a general mix of goods, there are a variety of Farmers markets in Gran Canaria. Being able to see the vibrancy and sheer amount of varied fresh fruits and vegetables available on the island makes the visit interesting on its own and worth a look even if you’ve booked full or half board lodgings (there’s alway more room when the food is this delicious!). Vacationers spending summer in the barren south are in for a surprise. More on the Maspalomas Market. Harbormaster, Puerto de Mogan. Jetty for ferry boats to Puerto Rico. There’s also a market day open on Fridays in Puerto de Mogan, the so called ‘little Venice’ of the Canary Islands. A worthwhile place to visit any day of the week because of the lovely atmosphere at the harbor. On top of that, it too has a sheltered sandy beach. More on Puerto de Mogan. 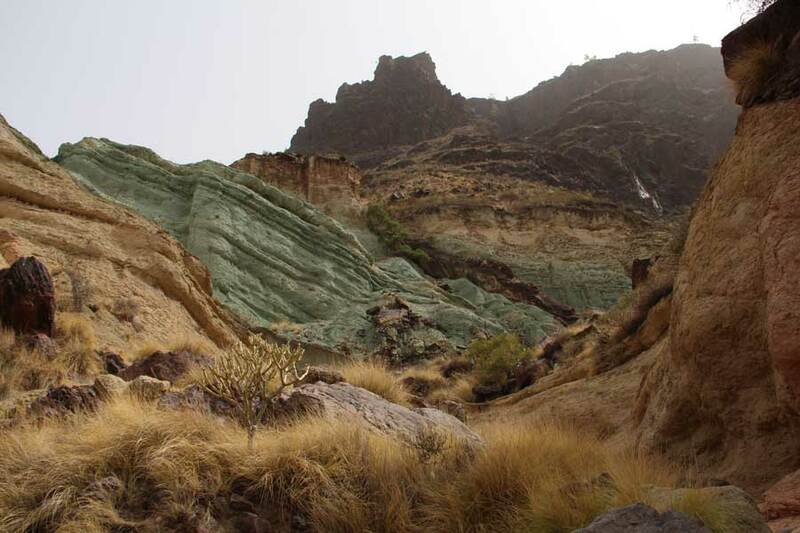 Just 50 kilometers in diameter, Gran Canaria is the perfect size for a round-trip island tour. 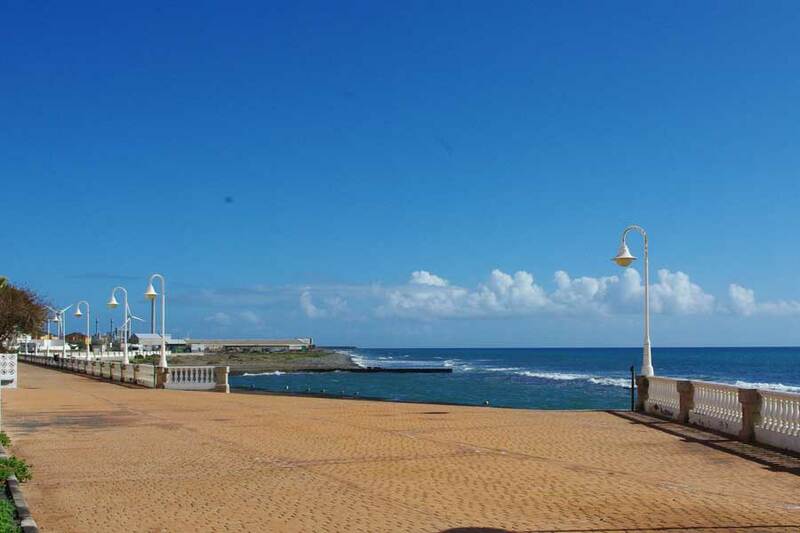 Starting (preferably in the morning) at Maspalomas, drive in the direction of Puerto de Mogan, then not just to the port, but to Mogan itself. From there continue onwards to the GC 200 (long road with viewpoints like Mirador de Arena Blanca) towards Aldea de San Nicolas de Tolentino, a route that, for a change, does not go directly along the sea. There are some impressive sights to see on the way, such as Los Azulejos where instead of just boring brown, the tiled cliffs shimmer in turquoise and blue. It’s easy to get swept up in the moment, but those wanting enough daylight to see other sites shouldn’t stay here long. Next stop – Mirador del Balcon, where you have not only a breathtaking view of the neighboring island of Tenerife with Spain’s highest mountain: the Teide (covered in snow during the winter) but also that of the steep coast running along its side. Eventually, after a winding drive you’ll reach Agaete. There used to be a Gran Canarian landmark in the sea here called Dedo de Dios (finger of God). Unfortunately, it succumbed over ten years ago to the tropical storm Delta, where ironically it’s finger broke off. Agaete is a good place take a break and recover from the long drive before continuing along the coast, past Las Palmas and back around to the south. There’s the option to take the fast fast route over the highway, or a detour going through Sardina, which is the better choice depends on personal nature and how much time is available. Instead of a round-trip you can also drive straight across the island for a different experience. 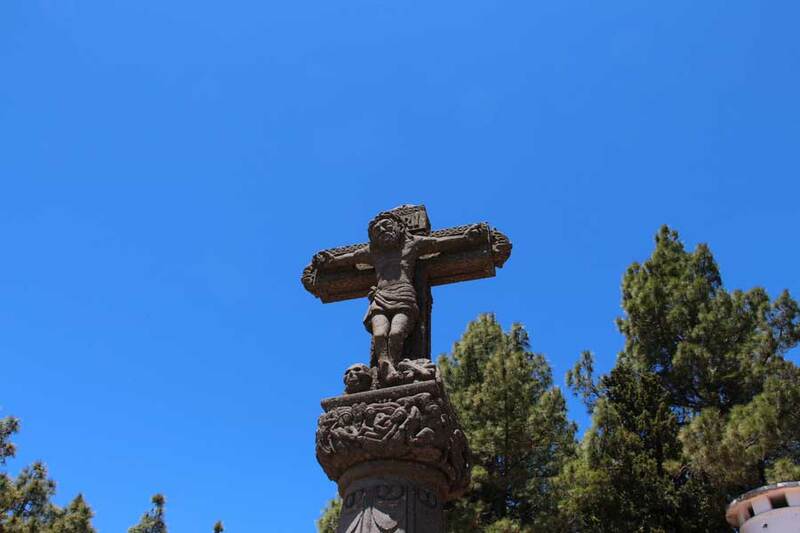 This trip has its fair share of interesting locations such as Cruz de Tejeda, Roque Nublo (a colossal lava chunk right in the centre of Gran Canaria) and Pico de las Nives, the highest mountain on the island towering 1949 meters, covered in old snow pits. The snow in these pits was once collected and brought down using donkeys to Las Palmas during the summer months. It was then used in hospitals or sold if no longer needed. Many of these snow pits can still be visited, and the view from them towards Playa del Ingles is great too. The Jardin Canario (Canarian Garden) is the largest botanical garden in Spain. Not only is it open every day of the week, entry is absolutely free of charge! 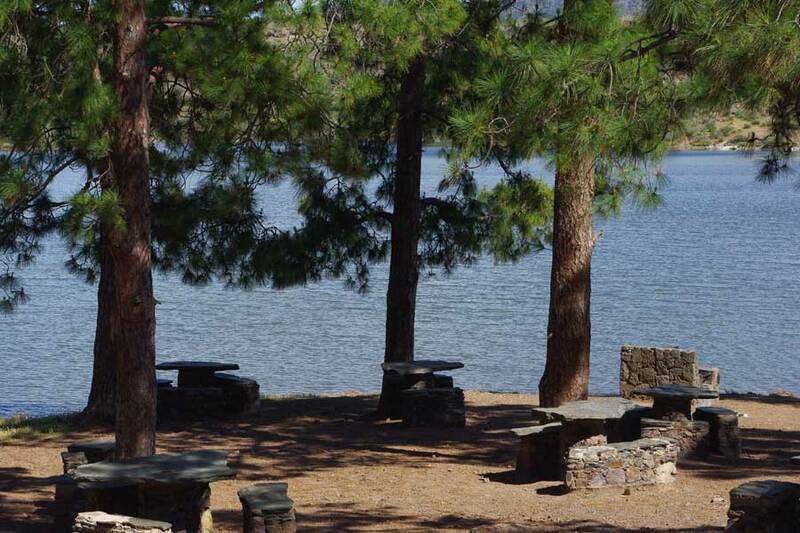 The garden is filled with small forests, cacti, palm trees, vibrant flowers and a small lake – an ideal location for nature lovers and photographers alike, or anyone looking to take a relaxing stroll. In my opinion, the only downside is that pets (dogs, for eg.) are understandably not permitted within the garden. Another, albeit smaller botanical garden called ‘El Parque Botanico de Maspalomas’ can be found at this address: Avenida Touroperador Neckermann, 2, 35100 Maspalomas. While far smaller than Jardin Canario, it is very well maintained with a good variety of plants and is also free. A charming little oasis in the heart of a touristic stronghold. Vegueta, the old town of Las Palmas, and the neighboring city Triana are both steeped in history. Vegueta was the founding center of the city and so several historical buildings can be seen lined up, a few here and there with an inscription describing their purpose. A stroll through the town can be paired with a visit to the market hall, open in the morning. That’s not all, it’s ‘Catedral de Santa Ana’ has a view overlooking the city and there are numerous museums too, such as Casa de Colón or the Museo Canario. However, as mentioned the museums require an entrance fee. 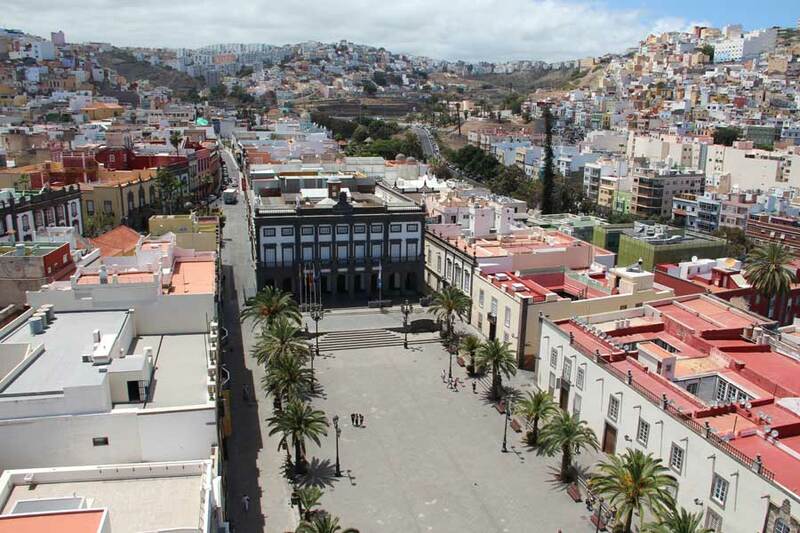 In the aforementioned old town of Las Palmas, you’ll find the Cathedral of Santa Ana (opposite the old town hall, behind the Columbus Museum) on top of which is an accessible roof overlooking the city. Visiting the cathedral itself is free, but this next activity does cost money (only a tiny fee to access the elevator). This elevator heads up the south tower of the cathedral and can be found to the right of the main gate. It costs just € 0.50 per person with no time limit, granting access to the rooftop lookout of the cathedral featuring a fantastic panoramic view of almost the entire city; not just the surrounding old town, but also the sea and mountains behind the capital and the harbor. If you’ve been up here, well, you could say you’ve see just about everything. After going up the elevator, you can even get a few metres higher with no extra charge by continuing up the right tower on foot. Though it would be a shame to miss out on this, those who’d rather not spend the money will still find plenty to observe in the cathedral square and town hall. Naturally, the famous Carnival parades in February and March are free to enjoy, as well as the Gay Pride parade in May. Moreover, various ‘Fiestas’ take place almost all year round in Gran Canaria; they’re a bit more manageable in smaller towns, where it’s less crowded than the main festivals in the city centre. If all else fails, the island is beautiful enough to take in as it is with your eyes only – go for a run along the coast, watching the waves crash and swirl or catch a bus to see what’s around and where the locals head off to (the bus fare is but a small investment). Here is a bus timetable for Gran Canaria. Have any suggestions, critiques or insider tips for us? Did we miss a great (free) attraction worthy of a Top Ten spot? Seen something amazing we should know about? Leave us a comment below! 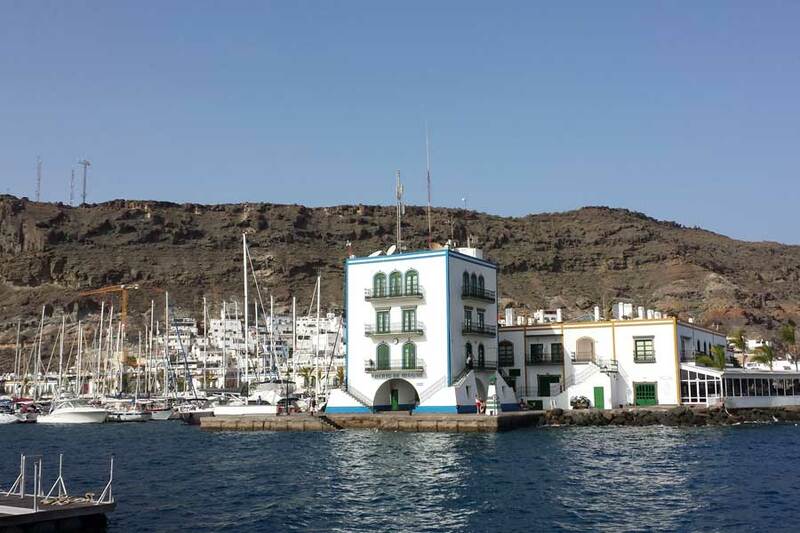 Gran Canaria Tips – Free activities and sightseeing destinations written by Bella D.
Hello, my name is Anabell and I moved from the far north to Gran Canaria in 2007. I love the great weather, the nice people and of course the sea. When I'm not working on websites, programming or taking photos, I do a lot with my dog.